Missouri Republican Roy Blunt claimed Thursday to be just short of the tally required to succeed embattled former Majority Leader Tom DeLay as the No. 2 Republican in the House, even as a potential dark horse candidate mulled a race. Blunt issued a statement claiming more than 100 supporters in the race, though his roster of supporters willing to make their names public contains fewer than 70 lawmakers. To win the race to replace DeLay, R-Texas, requires 116 votes, a majority of the 231 member House GOP conference. Rep. John Shadegg, R-Ariz., was inching toward a decision on whether to join the race, saying candidates Blunt and Rep. John Boehner won't move aggressively enough to drive the party, which is shaken by ethics scandals, out of its doldrums. An aide to Boehner said the Ohio Republican and chairman of the Education and the Workforce Committee has 86 committed supporters. Neither candidate's claim could be verified. Given the dynamics of the election, which is conducted by secret ballot, it is possible that one or both claims are inflated. 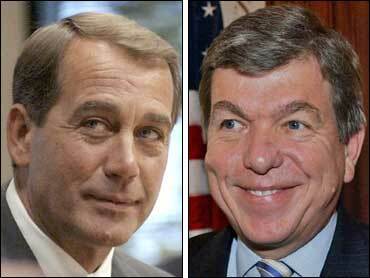 Before Thursday, Blunt and Boehner would only reveal publicly declared supporters, and the release of the new claims of support seemed in part designed to discourage new entrants into the race. The election will be held Feb. 2. Shadegg is positioned to run as the outsider and fresh face to Blunt and Boehner, each of whom has extensive ties to Washington's lobbyist money culture. But Shadegg has also shed more than $6,900 in campaign contributions from sources connected with disgraced lobbyist Jack Abramoff. The majority leader sets the House floor schedule and drives much of the day-to-day agenda of the fractious institution. Whoever wins the race could be well positioned to replace House Speaker Dennis Hastert, R-Ill., whom some expect to step aside in three years, after President Bush leaves office. Meanwhile, several rank and file Republicans led by Rep. John Sweeney of New York are pressing for a fuller examination of the leadership and elections for every leadership post except for Hastert's. The move reflects broader discontent about the state of the party's leadership in the House, though it's unclear whether Sweeney will garner enough support to force new elections. Blunt is currently acting as both whip and majority leader after DeLay's indictment last fall. For Blunt, that was a temporary arrangement that satisfied few Republicans. He was originally named chief deputy whip by DeLay in 1999 and won election to the No. 3 whip's post three years ago. DeLay announced last Saturday he would not seek re-election under pressure from Republicans expressed concerns about his ties to Abramoff, who pleaded guilty last week to three federal felony charges related to congressional influence peddling. Boehner won a seat at the leadership table when Republicans gained power in the 1994 elections only to lose the No. 4 post in GOP House hierarchy in the fallout after Republicans' poor showing in the 1998 midterm elections. He has served as chairman of the Education and the Workforce Committee since 2001 and played a lead role in passing Mr. Bush's No Child Left Behind education bill. He also engineered passage last month of a major pension overhaul bill. Shadegg is more conservative than Blunt or Boehner. He was elected to the House in 1994 in an election that produced its first GOP majority in 40 years.